Thankfully some things are history. Once bathrooms were cold, drab places where you didn’t linger any longer than was necessary. Even when they moved from the draughty privy to an upstairs room or a tin tub in front of the fire they were still places of relative torture and endurance. Even today many bathrooms can be spartan and uninviting..…but they don’t have to be. There was another kind of bathroom in the 19th and early 20th century, which was characterised by grace and charm. Villeroy and Boch took the history and the innate elegance found in many stately homes and upper class houses and updated it to form the classic Hommage bathroom collection….. and now, yet again, in the new 2015/16 collection, they have extended the range to include more choice to offer you a bathroom of timeless, traditional beauty. 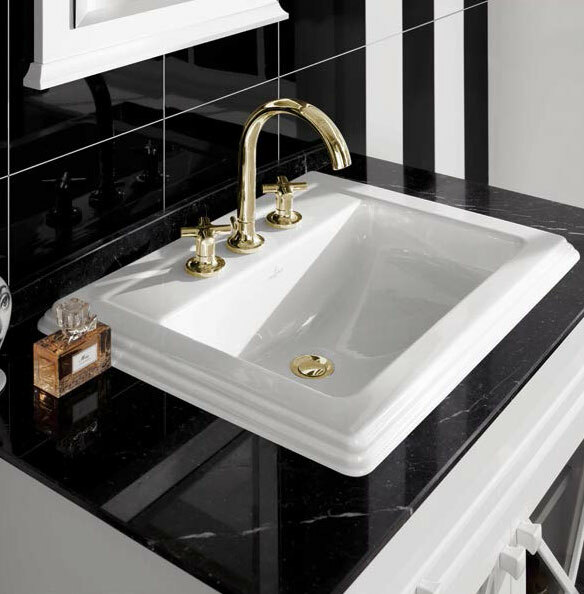 Offering a completely new look, all bathroom furniture is now also available in white matt lacquer and when teamed with the new black marble washbasin counter-tops they recreate the epitome of distinction and quality which was found in a bygone era. Updated with practical, yet traditionally styled fixtures using gleaming brass, rich wood, or marble, a bathroom echoing centuries of integrity and vintage appeal will enhance the modern high-end luxury new development, giving it a unique flavour which is also just at home in a more traditional home or refurbishment of the highest quality. Somehow history seems to have an nostalgic and enduring appeal to the senses, which Villeroy and Boch have appreciated and used to grace the bathrooms of today. Modernity and tradition have been united to offer us bathrooms of practicality and style. This entry was posted in Luxury Bathrooms, New Products, Villeroy & Boch and tagged Classic Bathrooms Designs, Homage, Homage bathroom collection, luxury bathroom design, Villeroy & Boch New Homage Range, Villeroy and Boch Homage. Bookmark the permalink.